Good morning everyone! Today I have another post for you from the Fashion Week in Milano. This time I went for a combination of this little dress with a Balmain blazer. I order to keep the look a litle more clean, I added a simple black blouse which match my favourite pair of Dior slingbacks in the black version with Swarovski rhinestones. 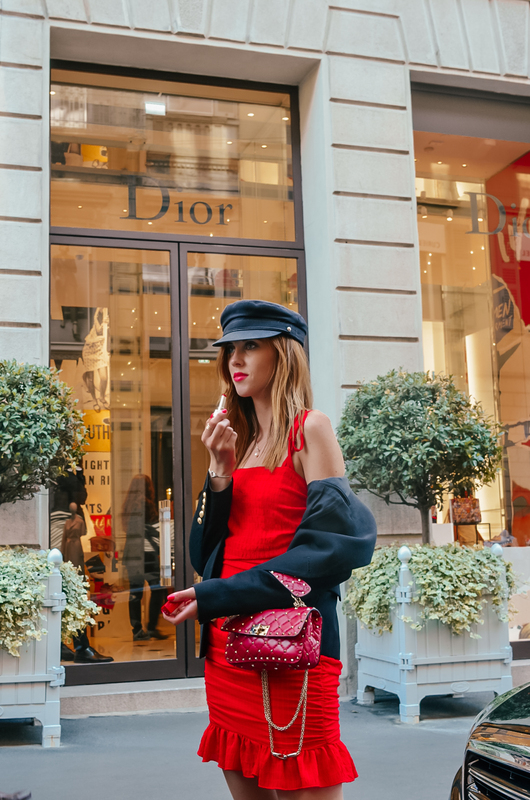 The ultimate accessory of this look is the newest Rouge Dior lipstick introduced by the brand Dior, in the shade 999. Who follows me for a long time knows, that I am a big fan of lipsticks, especially of the red ones. The colour 999 is actually one of my favourite - I think it's a perfect bright shade for me, which stands out especially when wearing red tones. 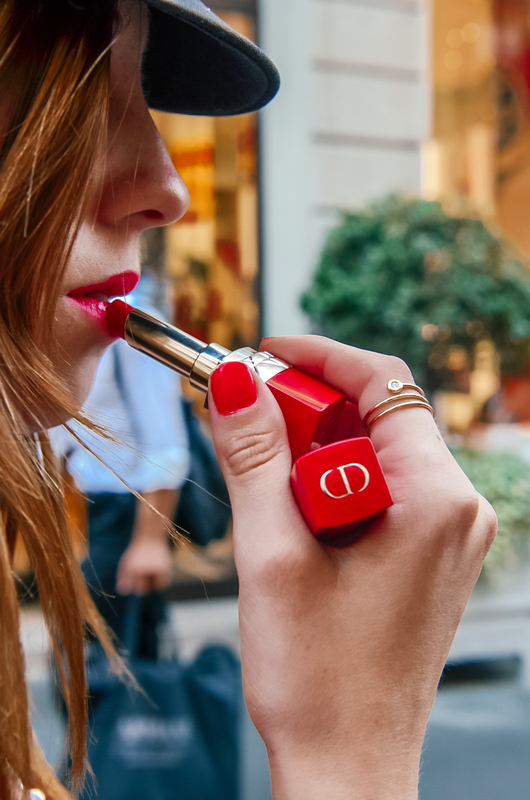 Dior Rouge speaks out to me a lot since the texture of the lipstick is very soft, yet doesn't make the lips dry. In addition the colour is very long-lasting which is a big benefit for me. I have matched my new Valentino bag with the colour of my new bag - I think that this is such a cute details, don't you think?! Krásné ráno všem! Doufám, že se všichni máte super! Dneska mám pro Vás další post z Itálie, tentorkát další outfitový článek. Na sebe jsem si tentokrát oblékla nové červené šaty z Revolve, které jsem doplnila černým blazerem od značky Balmain. K outfitu jsem přidala oblíbené slingbacks od DIora. 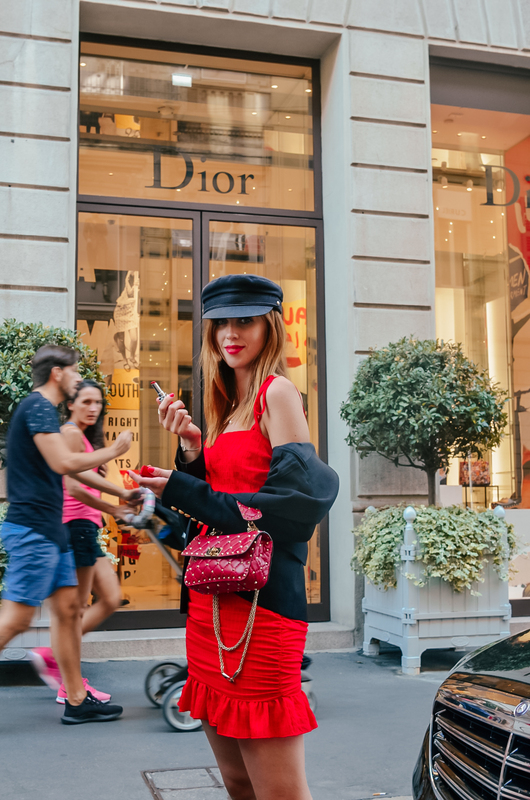 Hlavním doplňkem tohoto looku je nová červená rtěnka Rouge Dior 'Ultra Rouge' od značky Dior, kterou já mám na sobě v odstínu 999. Tato barva je pro ikonickou a klasickou červenou, která nikdy nezestárne. Samotná texture rtěnky je opravdu jemná a rty zbytečně nevysušuje. Rtěnku jsem sladila se svojí kabelkou od Valentina, což mi přijde jako skvělý detail. Tak jak se Vám fotky líbí? Yoy look stunning in this red color. Love your lipstick and, of course, your amazing dress! Zato sis toho jako první všiml/a! Děkuji, opraveno. You're looking absolutely stunning in that outfit!